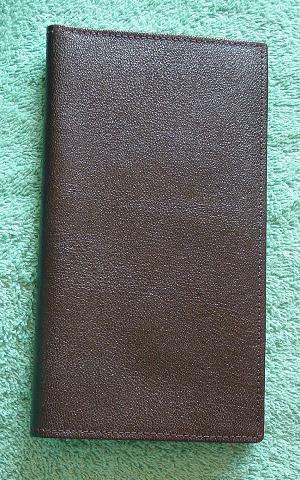 This vintage dark brown hand-grained Moroccan leather wallet is by Dopp. The left inner side has a top to bottom side zippered section on the left and the right has a top to bottom open pocket. 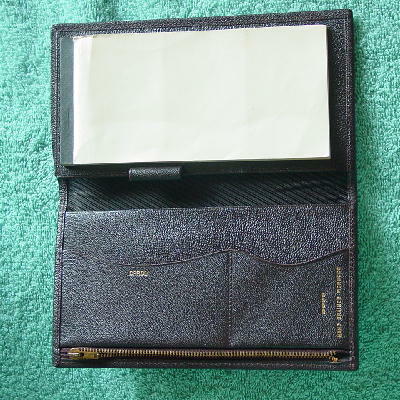 On the front is a compartment that says cards, and below that a smaller compartment. The right inner side has a note pad in the front with each sheet having 3 perforated sections. There is a (thin) pen or pencil holder and behind that is an open 2-sided section. It has a tone-on-tone brown lining. It's from a former new York male model. He got it as a gift from his first wife. He said he only used it twice.